What would you do with 8 days in Alaska? It’s hard to narrow down all your choices. Glacier trekking? Whale watching? Kayaking with the otters and seals? Getting up close and personal with the bears? The good news is, you can do it all! We put together the ultimate 8-day itinerary for a once-in-a-lifetime Alaskan adventure. Is Alaska on your bucket list? Maybe you’ve watched enough Travel Channel to have an idea of what you want to do and see while you’re there. There’s definitely the bears (and all the other amazing Alaskan wildlife), the whales and seals and salmon, and of course, the glaciers. But putting it all together into one amazing summer trip to Alaska can be a little daunting. With that in mind, we’ve created the ultimate 8-day Alaska itinerary—we promise, you won’t miss a thing! Day 1: Go moose-spotting on Alaska’s Coastal Trail in Anchorage. Most Alaska tours begin and end in Anchorage, and it’s a great city to visit. But just because you’re in the city doesn’t mean you’re far away from native wildlife. The Tony Knowles Coastal Trail begins in downtown Alaska and winds along for 11 miles to Kincaid Park. 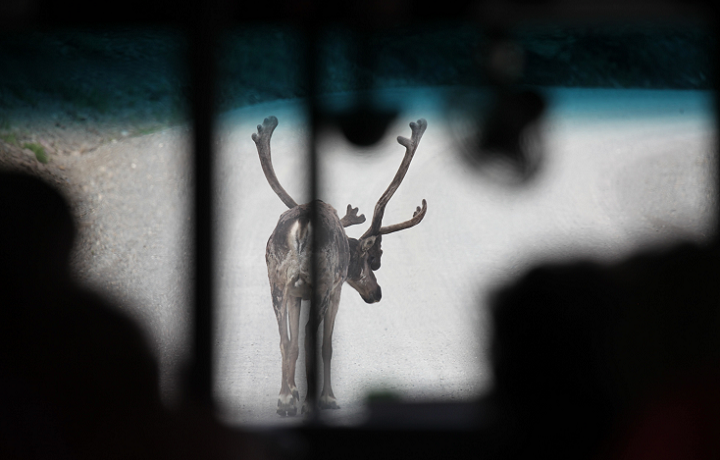 Take a walk—or rent a bike and cycle—and you’re bound to spot a moose along the way. You can even watch for whales and bald eagles at viewing spots along the trail. Spend the night in the Copper Whale Inn for easy access to the trail—it’s just a block away. And the views of Cook Inlet from this charming B&B are amazing; be sure to have your camera ready! Day 2: Hike the dramatic Eagle River Valley and see the spawning salmon. The Eagle River Valley is less than an hour from downtown Anchorage, but it might as well be another world. Besides dramatic waterfalls and towering cliffs, the valley is a refuge for wildlife—moose, beavers, owls, eagles, and of course, the salmon. You can visit the salmon-viewing deck near Beaver Pond and watch the salmon jump over the dam to continue their journey to spawn. It’s an experience you’ll never forget. When you’re done for the day, head back to Anchorage and enjoy craft beer from a local brewery. Would it surprise you to know that Alaska has an active brewery culture? It ranks 3rd in the U.S. for amount of beer brewed per capita—a whopping 12.5 gallons! 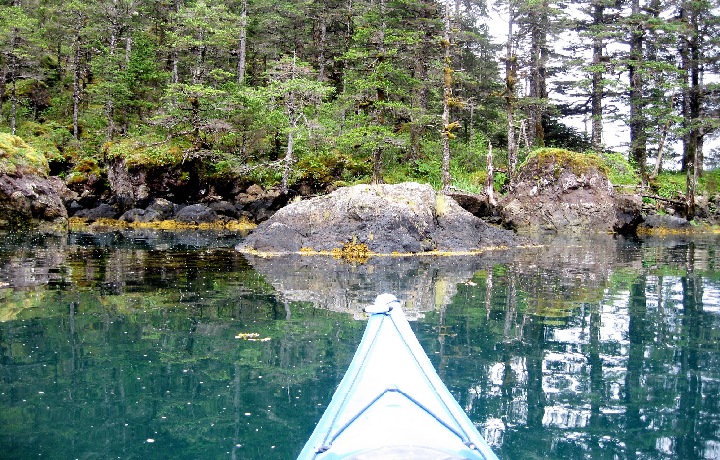 Day 3: On to Seward and Resurrection Bay to kayak with the otters and seals. Seward is the gateway to the incredible Kenai Peninsula and the wildlife-packed Resurrection Bay. The bay’s ecosystem is the perfect home for sea otters and harbor seals—you’re bound to come get-to-face with a few as you paddle your kayak. 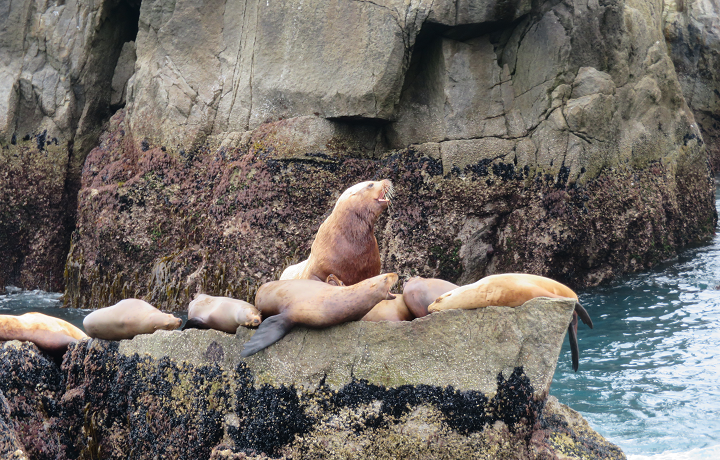 Don’t be surprised to see humpback whales and killer whales breaching the surface, or a Steller sea lion or two sunning on the rocks. Spend the night at the impressive introduction to Kenai. 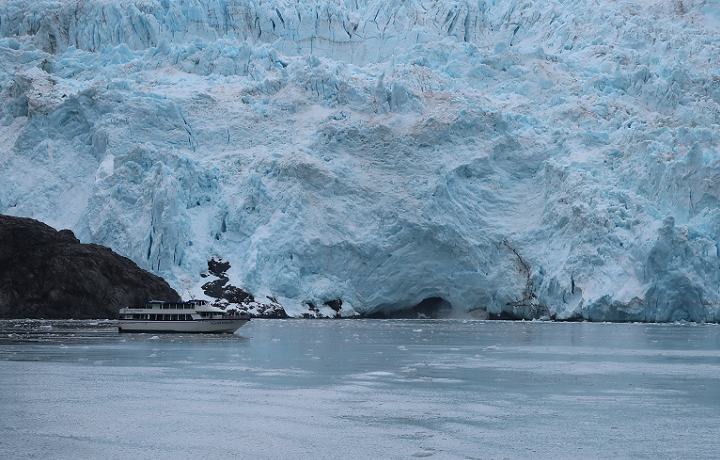 Day 4: Whales, sea lions, and glaciers—oh my! Kenai Fjords National Park is everything you imagine Alaska to be—all in a single place. Take a catamaran boat tour deep into the park and its incredible glaciers (40 of them, to be exact, and each more incredible than the last). You’ll see birds and marine wildlife, especially pods of whales, and majestic eagles soaring overhead. You’re bound to work up a brisk appetite after your day of exploration, so why not enjoy an all-you-can-eat salmon and prime rib buffet? You know you’ve been looking forward to fresh Alaskan salmon, so tonight’s your chance to eat your fill. Day 5: Walk part of the Harding Icefield trail to get up close and personal with Exit Glacier. 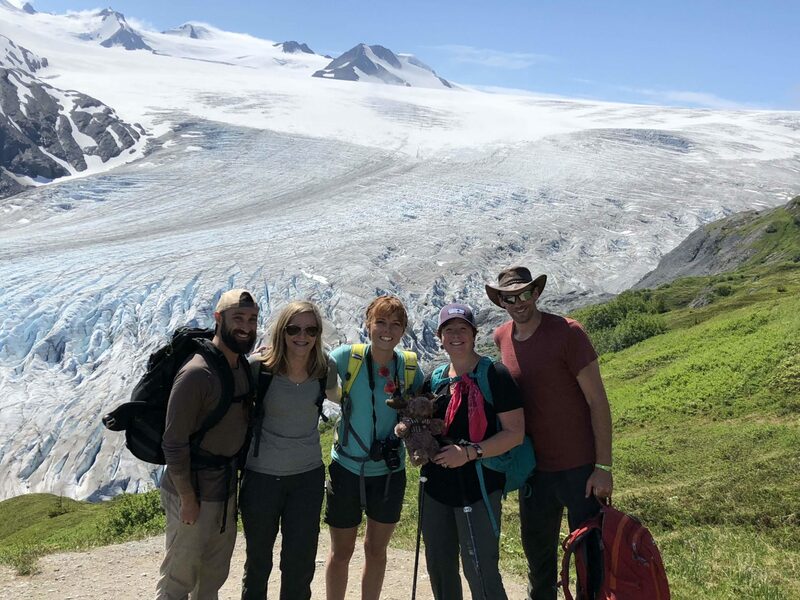 If you thought seeing glaciers in the distance from your deck on a catamaran was a mind-blowing experience, wait until you trek the Harding Icefield trail to actually touch a glacier! It’s a once-in-a-lifetime experience to cross off your bucket list today. You don’t even need to be a hiking rock star to walk the lower “Edge of the Glacier” trail. It’s an easy walk that gets you close enough to hear the glacier crackling and get some amazing photos with the gorgeous blue glacier behind you. Exit isn’t the largest glacier in Alaska, but when you’re right beside it? It’s massive, trust us. From there, check into the gorgeous Alyeska Resort and enjoy a feast at the renowned Seven Glaciers Restaurant. Take a swim in the saltwater pool or treat yourself to a massage at the hotel spa to prepare you for your next day’s adventures. Day 6: The float plane ride to the bears at Brooks Lodge will blow your mind. We get it—you’ve been dying to see the bears. Today’s your lucky day! After an incredible float plane ride to Katmailand, you’ll be at the world-famous Brooks Lodge, where you’ll see your first bears within minutes of your arrival. 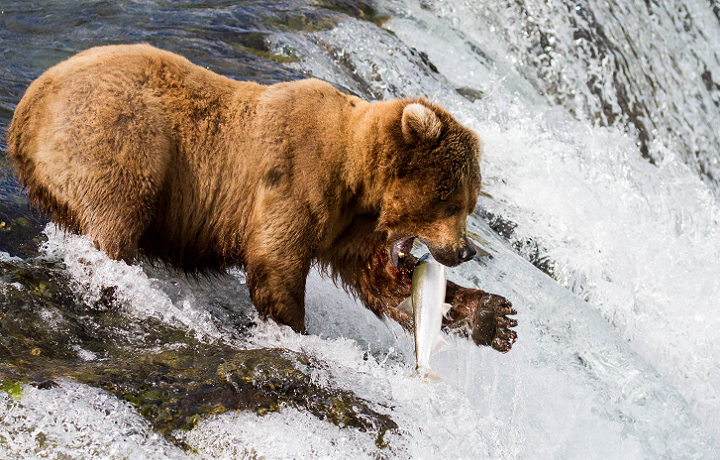 People come from all over the world to get close-up looks at Katmai brown bears gorging themselves on salmon. Brooks Falls is one of the first places the bears come in contact with spawning salmon making their way in from deeper waters where the bears don’t hunt. That’s why it’s so popular with the hungry bears, and they gather here in numbers you won’t often see elsewhere in Alaska. There’s nothing like watching a bear stand and wait for a salmon to jump close enough to grab it in its jaws, or snorkeling about looking for fish underwater. It’s almost impossible to get a room at Brooks Lodge during bear season, unless you plan months and months (and even years!) in advance, but we have a special arrangement with the lodge for our guests, so if bears are a must-see on your Alaska vacation, you’ll definitely want to get to Brooks Falls. Day 7: There’s nothing like the volcanic landscape in the Valley of 10,000 Smokes. 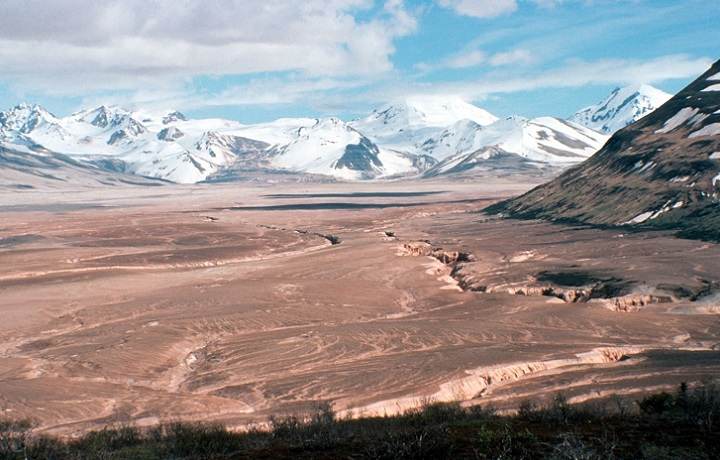 In 1912, a volcano named Novarupta spewed lava and ash over Katmailand for three straight days, forever changing the Ukak River valley. It was the largest volcanic eruption of the 20th century. Today, you can visit the Valley of 10,000 Smokes and hike the eerily beautiful valley—or take a flightseeing tour to get a bird’s eye view of the dramatic landscape. After your volcano adventure, return to Brooks Lodge for more bear viewing and a dinner-time feast on local Alaskan cuisine. Day 8: Say goodbye to the bears before boarding your flight back to Anchorage. Ready to visit the Last Frontier? There’s nothing like Alaska’s unique culture and wildlife—it’s something you just have to experience for yourself. If the Last Frontier is calling your name, get in touch and let’s put some plans in motion. 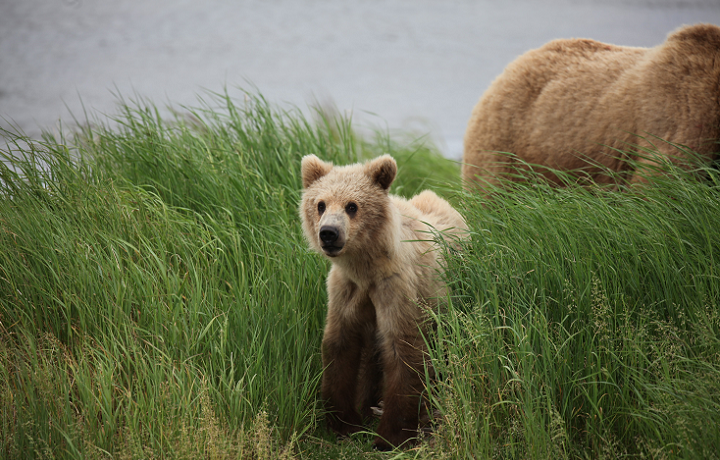 We still have a few spots left on our July and September tours, and there’s no better time to see the bears. Why not see what’s available?